The Estate winery was conceived and constructed by Panagiotis Hatzinas; it is situated in the north side of the Kokkinogia vineyard. With clean, austere surfaces and wholly shielded with limestone, it refers directly to New World winery style. The winery was designed according to the functional use of space and machinery. State-of-the-art technological equipment was selected on the basis of a minimum processing of grapes, must and wine in order to protect and reveal the fruit's full potential. The ground floor is used as vinification cellar, equipped with modern inox tanks for fermentation and stocking purposes, and also lodges a hall for bottle ageing and conservation. Wine from tanks is transferred by gravity to the underground cellar, where, under continuous control of ambient conditions, the wine matures in oak barrels from central and northern France for a period of several months. 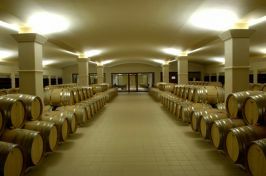 In the centre of the underground cellar is situated the impressive tasting room with a breathtaking view of the barrels. As a member of the Wine Producers Association of the Northern Greece Vineyard (www.wineroads.gr) and a stopping point on the Wine Roads of Dionysus, the Ktima Pavlidis welcomes visits from wine lovers daily from 10:00 to 14:00 o'clock.